Spring is springing, and it's springing fast! It's one of my favorite times of year on the river, as we shrug off the cold, gray dormancy and transition to blooms, warmth, and activity. It's also one of my favorite times of year in St. Augustine, as festival season starts up. I've got two events in particular on my radar this Spring: the Minorcan Heritage Celebration, which takes place this Saturday, 3/3, and the Saint Ambrose Catholic Church Fair, on Sunday, 3/18 (tip: come early for the chowder). Both offer unique glimpses into old St. Augustine, and the communities who have helped sustain it. Spring is a time of new beginnings, so it's only appropriate that Matanzas Voices is cookin' up a new initiative. 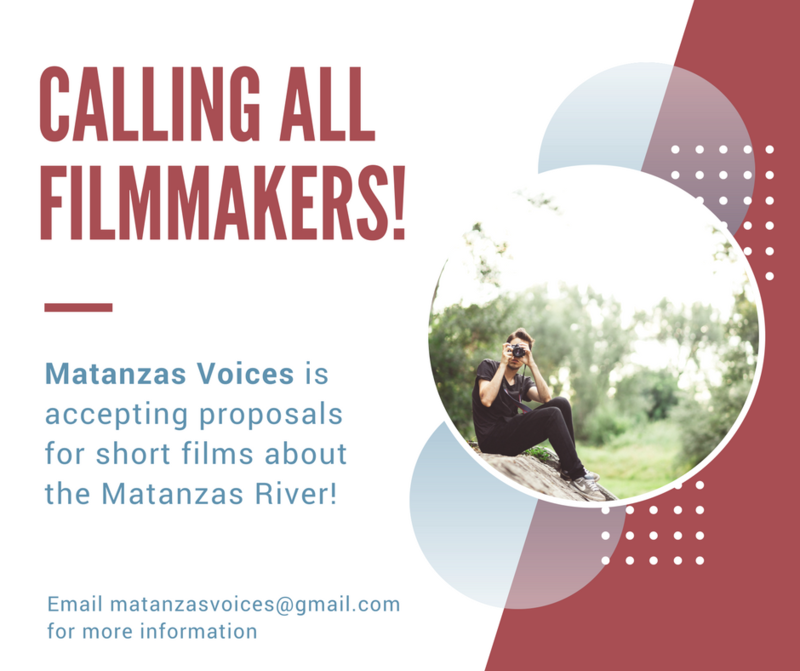 For the first time ever, Voices is commissioning two filmmakers to bring their story ideas about the Matanzas River to the screen. Read on for details! Sometimes, though, what we start doesn't always end how we think it will. That's the lesson we learn from Hugh Mercer, who is this month's Voices Spotlight. "Dealing directly with nature is a very chancy proposition," Mercer says. "She's a sort of a jealous thing." And finally, we're pleased to invite you to the Friends of Matanzas annual meeting at Genung's Fish Camp on Saturday, March 17th. Join us to learn about ways you can help protect the Matanzas River watershed. We hope to see you there! Today is the FINAL DAY for submitting your ideas for our first-ever film competition! We are commissioning two filmmakers to bring stories about the Matanzas River to the screen. Be sure to send your pitches tomatanzasvoices@gmail.com by 5pm this afternoon! Originally from Sayville, New York, Hugh Mercer comes from an "aquaculturally-bent" family. He followed in his father's footsteps working for the renowned Bluepoints Company, a northern purveyor of shellfish, before answering a 1967 ad in a fish journal about a pompano project in St. Augustine. The plan did not go as expected. "We started Holmer Farms, which was a fish farming proposition. And we dug what the then superintendent of the [Fort Matanzas National Monument], a man named [George F.] Schesventer, called 'unsightly ditches in the marsh.'" That was just the beginning of his troubles. Read one to hear more from Hugh Mercer. We always look forward to your feedback, and welcome ideas and suggestions for project themes, events, and interviews. This month, we're particularly interested in your suggestions about historic/bygone eateries. Which restaurants do you miss? Which were central to St. Augustine and her communities but are no longer here? Drop us a note any time at matanzasvoices@gmail.com. Interested in protecting the Matanzas River watershed? Please join us for the Friends of Matanzas annual meeting on Saturday, March 17th, to learn about ways you can get involved. The event is a potluck at Genung's Fish Camp from 4-7pm. Friends of Matanzas is a citizen-supported advocate for the Matanzas, and is the umbrella organization overseeing both Matanzas Voices and the Matanzas Riverkeeper.